Starbeck has entered the top tier of local cultural attractions, with the creation of its own conservation area. The new Starbeck Spa Conservation Area covers Spa Lane and Spa Road, and includes some of Starbeck’s oldest and most significant buildings. It is hoped the designation will preserve and publicise the best of Starbeck’s built heritage. Naomi Kempton, senior conservation and design officer at Harrogate Borough Council, said: “This designation will conserve the area as part of our heritage for the benefit of the community and beyond. It’s an important part of our spa and railway history. Starbeck Spa is the district’s 53rd conservation area; others include the leafier parts of Harrogate, as well as rural beauty spots like Ripley, Pateley Bridge and Hackfall. 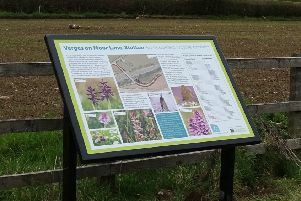 The new conservation area includes some unique remnants of Starbeck’s past. The stream that gives the place its name – Star Beck – runs through it, and there are also former railway workers’ cottages and a number of grand old spa buildings, including Starbeck Baths, Starbeck Mews, Starbeck House, Starbeck Bowling Club, The Pavilion and Castle Gate Mills. Also included is the former Star Inn on the High Street and the terrace of cottages on Spa Road. The whole process began when members of Starbeck Residents’ Association urged Harrogate Borough Council to create a conservation area. In response, council officers held a public workshop last summer, and residents identified what they felt contributed positively to the character of the area. The council’s planning committee finally rubber-stamped the creation of the zone last month, when the Starbeck Spa Conservation Area Appraisal was also approved. This document details the character, history and heritage of the Spa quarter of Starbeck, and will be regarded as a definitive description of the area. Ms Kempton said: “Hopefully people will use it as a resource, for example when they’re putting in planning applications; it should also help us get better planning decisions. The growth of Starbeck was fuelled by its waters and its railway. It originally grew out a scattering of cottages and farmhouses, following the discovery in the 1600s of a mild sulphur spring and a chalybeate (iron) spring. The springs were known as Starbeck Old Spa and became very popular. Knaresborough Spa Baths, now known as Spa Mews, and the Prince of Wales Baths, better known today as Starbeck Swimming Baths, date from this period, and are both included in the conservation area. In the mid-1800s, the railway came to Starbeck, boosting the local economy and providing most of the villagers’ livelihoods. Starbeck is no longer a spa destination, nor does the railway act as a driver for growth, but it still has a strong community spirit and many of its residents are determined to keep the memory of its proud history alive.